So many businesses grapple with this seemingly simple question that I decided to write my first blog post on just that – leasing vs. purchasing. If you haven’t already, check out that original blog post here. However, to give you the gist without spoiling a fantastic blog post (if I do say so myself) in almost every situation leasing is preferable to making an outright purchase. In my experience, one of the most coveted attributes decision-makers look for when entering into a financial agreement is flexibility. And, if flexibility is important to you and your business, leasing is the way to go. Before I go on, I want to quickly discuss the growing popularity of leasing professional and industrial equipment. The American industry think tank, the Equipment Leasing and Finance Foundation (ELFF), publishes an annual report on the state of the equipment finance market. 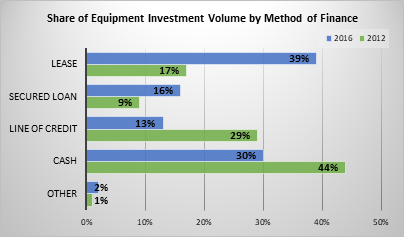 In 2017, the ELFF found that leasing made up 39% of total equipment investment volume in 2016, up from 17% in 2012. As a financing method, leasing beat out secured loans, borrowing on a line of credit, and even paying in cash to become the most popular form of equipment financing that year (see Figure 1.1). Now, these numbers represent all types of equipment financing across all industries, but they give us a strong sense of where the market is heading. 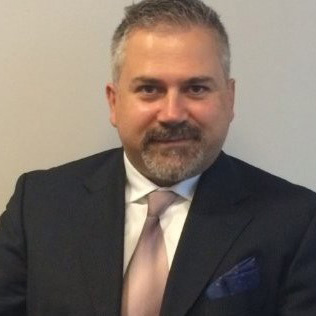 Leasing is far and away a more popular method of financing than borrowing on credit or taking out a loan, and if interest rates remain low, I suspect it will continue to beat out cash for the top spot. One of the most obvious benefits to leasing your print equipment is the flexibility it affords your finances. A business line of credit is designed to give your company access to short-term funding for operational expenses like supplies, payroll, increasing inventory, etc. However, borrowing on a line of credit to finance a major equipment purchase (e.g., a new industrial or production printer) or a new fleet of office Multifunction Printers (MFPs) can put considerable strain on your access to funding, limiting your ability to direct funds elsewhere when they’re needed. Loans, on the other hand, often require additional collateral to secure, with banks sometimes filing a blanket lien on all current and future assets of your company should you be unable to meet your obligations. As well, banks generally lend a portion of the equipment cost, requiring you to provide a down payment which can amount to 20% to 40% of the total price of the equipment – ouch! All these downsides are avoided by choosing to lease rather than purchase. In almost all cases, there is no collateral associated with a lease other than the equipment itself. This saves you from having to worry about other business assets in the event your company is unable to meet its financial obligations. As well, leasing almost never requires any form of lump sum payment; there is no down payment associated with a lease, which grants you the ability to direct those funds – be they your own, or drawn from a line of credit – elsewhere. Stable, predictable, and recurring lease payments allow you the flexibility to direct more of your business’ funds to your day-to-day operations. The terms of a lease are also heavily defined by you and your budget which offers even more flexibility. In the same way that you would lease a car, you can choose the length of your lease (12 months, 24 months, 36 months, etc.) which will in turn impact your monthly payment (the longer your term, the lower the monthly payment). The lease application process is also quick and painless, especially in comparison to a loan or line of credit application. Banks are notoriously slow decision makers; it can take up to two weeks or more for your request to even be reviewed. Leasing decisions, by contrast, take only a few hours because they are reviewed and agreed to by company representatives. For example, at Konica Minolta Premier Finance, most of our customers know if they’ll qualify within 4 business hours. Finally, and perhaps most importantly, leasing allows you the added flexibility to upgrade your technology at any point during the term of your lease. In my experience, this is one of the most commonly cited reasons our clients choose to lease their print equipment. When you make an outright equipment purchase, you are stuck with that equipment through thick and thin. Technical breakdowns aside (assuming you’re covered by some form of warranty or service package), your equipment will eventually become outdated and/or obsolete. By leasing your technology and retaining the ability to upgrade your equipment, you are effectively future-proofing your organization for the duration of the lease. All in all, lease agreements tend to offer more flexibility than a loan or line of credit agreement. However, the final decision is of course up to you. Not every business is the same, and you should carefully consider your financial situation before deciding whether to lease or loan. If you are still unsure which option is right for you, reach out to Konica Minolta today and we can help answer your equipment financing questions.